The 1981 performance “Circle and Square” by Takahiko Iimura, New York-based Japanese film and video pioneer, evolved from the artist’s interest in exposing the apparatus of projection and the materiality of image and light begun in the mid-60s. The work commences with the projection of a long loop of black 16mm film leader suspended from the ceiling. The artist punches a hole on the film’s surface and as it loops through the projector’s gate, a single white circle of light pierces the darkness. With each subsequent punch the film builds before the viewer’s eyes into a cascade of white circles before reaching its abrupt and revelatory conclusion. Joel Schlemowitz’s new performance “Kannon, The Goddess of Mercy” unifies various techniques, instruments, and arcane interests of the artist’s twenty-year practice into a single work. Schlemowitz generates anaglyph 3D imagery in real time through the superimposition of images from two overhead projectors, while performing a 78rpm soundtrack on the Victrola. 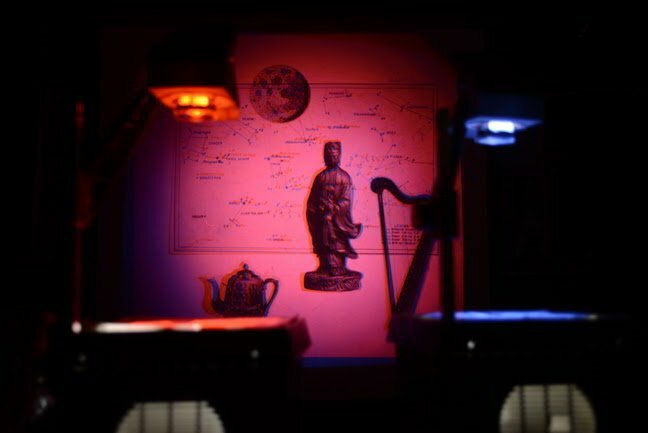 The imagery is culled from ancient Chinese joss paper, tarots, and star charts portraying the Goddess Kannon as she enters the red chamber to observe the different phases of the moon. Takahiko Iimura, born in Tokyo in 1937, is a pioneering artist known for his work with film, video, installation, performance, and digital technologies spanning more than 50 years. Iimura first began working with film in 1960 and was instrumental in the burgeoning Japanese experimental and independent film scene. Iimura moved to the US on a Fellowship from Harvard University in 1966 and soon immersed himself in the mid-60s New York experimental film and art community. 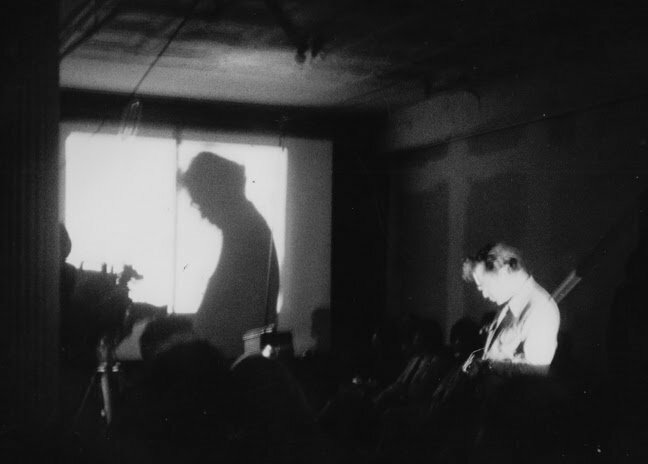 Early videos were included in exhibitions at the Museum of Modern Art of New York and PS1 (1975), and Centre Georges Pompidou in Paris, France (1977), while other performance based works and interactive installations were featured in the 1979 two-person exhibition “New Video” (with Shigeko Kubota) at the Whitney Museum of American Art, New York. Among the institutions that have exhibited Iimura’s works are Anthology Film Archives, New York, NY; Film Society of Lincoln Center, New York, NY; Guggenheim Museum, New York, NY; Metropolitan Museum of Art, New York, NY; Museum of Modern Art, New York, NY; The Kitchen, New York, NY; Los Angeles County Museum of Art, Los Angeles, CA; Pacific Film Archive, Berkley, CA; Walker Art Center, Minneapolis, MI; Carnegie Art Museum, Pittsburgh, PA; Cinémathèque Française, Paris, France; Centre Georges Pompidou, Paris, France; Jeu de Paume, Paris, France; Tate Modern, London, UK; Serpentine Galleries, London, UK; among others. Iimura’s work is in the Collections of the Metropolitan Museum of Art, New York; Fondazione La Biennale di Venezia, Venice, Italy; Centre Georges Pompidou, Paris, France; Museo Nacional Centro de Arte Reina Sofia, Madrid, Spain; Neuer Berliner Kunstverein, Berlin, Germany; Tokyo Metropolitan Art Museum, Tokyo, Japan; and the Whitney Museum of American Art, New York; among others. Takahiko Iimura currently lives and works in New York. Joel Schlemowitz is a Brooklyn based artist working with multiple mediums including celluloid film, installation and collage. Schlemowitz’s work has been exhibited at Microscope Gallery, Courthouse Gallery at Anthology Film Archives, NY; KUMUKUMU Gallery, NY; Bound & Unbound Gallery, NY; Museum of Contemporary Cinema, Madrid; Ukrainian Institute of America, NY; and The Images Festival, Toronto, Canada, among others. His films are widely screened at cinemas, festivals, and institutions including at The Museum of Modern Art, The Whitney Museum, Harvard Film Archives, Brooklyn Academy of Music (BAM), the New York Film Festival, Tribeca Film Festival, among others. Schlemowitz has received grants from the Jerome Foundation and New York State Council on the Arts. This fall, the Whitney Museum of American Art presents Dreamlands: Immersive Cinema and Art, 1905–2016, a landmark exhibition that focuses on the ways in which technology has created new forms of immersive experience using the moving image. Artists have dismantled and reassembled the conventions of cinema—screen, projection, darkness—to create new readings of space, optical form, and time. The exhibition will fill the Museum’s 18,000-square-foot Neil Bluhm Family Galleries on the fifth floor, as well as the adjacent Kaufman Gallery, and will include a substantial film program in the Susan and John Hess Family Theater, and a series of expanded cinema events organized by Microscope Gallery in Bushwick, Brooklyn, in collaboration with the Whitney. Organized by Chrissie Iles, the Whitney’s Anne and Joel Ehrenkranz Curator.